Marco Fabian was grinning from ear to ear on Saturday. 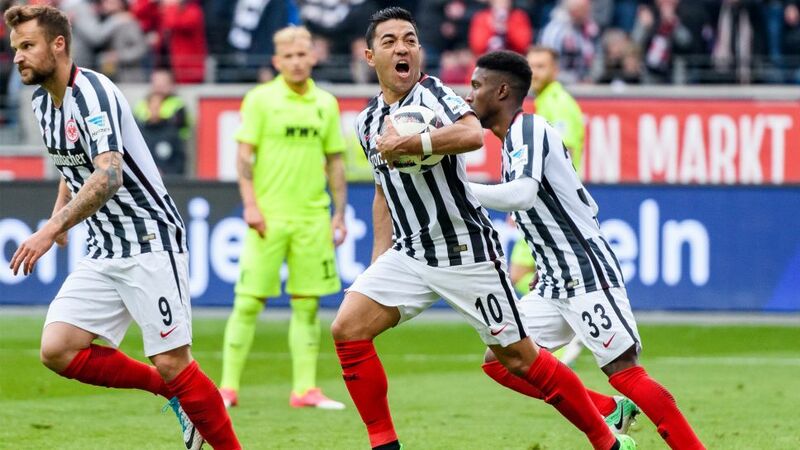 Eintracht Frankfurt had finally ended their ten-game winless run with a 3-1 victory over Augsburg, and the man of the moment was the playmaker from Mexico, who laid the foundations for success with a second-half brace. With seven goals and four assists this season, the 27-year-old is Frankfurt’s biggest goal-threat and has created a renewed sense of optimism for the Eagles’ fans ahead of their DFB Cup semi-final against Borussia Mönchengladbach on Tuesday. The fans were cheering for a trip to Berlin at the end of May, and the club now believes that European qualification is a possibility this season. Following the Augsburg win, Fabian spoke about the team’s chances in the semi-finals and Eintracht’s European dreams. Want some Mexican flair for your Official Fantasy Bundesliga team? Click right here! Question: Mr Fabian, have you ever scored a top-flight brace before? Fabian (laughs): No, that was actually the first time ever. Question: Will you be celebrating then? Fabian: No, we have an important game in the DFB Cup on Tuesday, so have to concentrate on that. The party will happen during the holidays. Fabian: Yes, I was just so pumped-up. The support from the crowd was amazing, the whole stadium was celebrating. The support here is always great – we’re always encouraged forward and we’ve now been able to pay the fans back with a win. Question: That was a massive effort by the entire team against Augsburg. Fabian: We knew beforehand that it would be a hard-fought game. You have to run two or three times more against a team like Augsburg and come out on top in challenges. I’m shattered, but that’s always the case after a Bundesliga match. And I’m really happy right now. Watch: Owo meets Marco Fabian! Question: Was your second goal about desire with the rebound? Fabian: You have to be persistent, tenacious and always believe you can score a goal. We had chances before that, so you can’t just hide away. You have to continue believing even when things don’t always work. Question: You are currently Eintracht’s top scorer. Are you used to scoring so many goals from back home in Mexico? Fabian: I always try to score, whether I play in an attacking or more defensive role. It was the same at my former clubs in Mexico, where I also managed to score a goal or two. Question: How great is the relief that fears of relegation have now been banished? Fabian: I didn’t want us to have to go through the same drama as last season when we only survived through the play-off against Nürnberg. So, it’s a massive relief and a real pleasure to know we won’t have to experience that again. We’re now allowed to dream and look towards Europe. Question: That dream could possibly begin in the semi-final of the DFB Cup against Mönchengladbach on Tuesday. Fabian: That’s right. It’s the final step towards the final. You don’t get chances like this too often. Question: You can really crown your season on Tuesday, right? Fabian: That’s our dream, the reason we live. Every success needs hard work and a positive mind-set, and that’s how we’re going into the game on Tuesday. Question: How big a chance do you now have to reach the final in Berlin and even the Europa League? Fabian: Many teams are fighting for the Europa League positions in the league right now. It’s really tight there but it’s in our own hands. We’ll do everything we can to achieve that. As for the semi-final, it’s a decisive game – like a final before a final that we want to win. Click here for more Eintracht Frankfurt news.